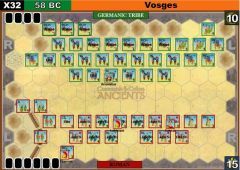 I once again went with Leadership cards ordering reinforcements here for sake of familiarity and consistency but I can see that it’s possible the Romans will never draw into one with their Command of 4, and so lose. 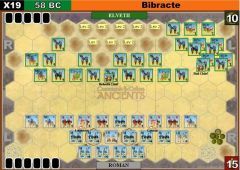 However, I’ve risked that because I really like the idea of increasing Command as the senior generals of the army arrive in the nick of time (Labienus was Caesar’s second in command). I think reading between the lines of his matter of fact account that this was a desperately close thing and that Caesar almost lost the lot here, as evidenced by the terrible risk he took in sending cohorts outside the protection of the contravallation. I wanted that tension and feeling of imminent disaster while Rebilus and Reginus desperately hold out for reinforcements. I’m happy this will deliver. 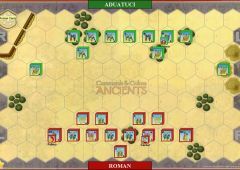 The rear assault by Caesar looks game breaking but from experience mistimed reinforcements behind enemy lines can go badly astray. 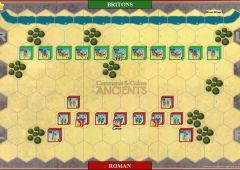 Get it wrong, find the cavalry’s retreat paths cut off by the whole Gallic army, and the Roman player may find he has cut Caesar’s glittering military career abruptly short. Again, I may have taken historical licence here. 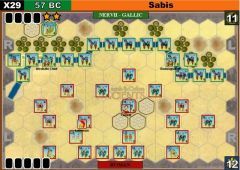 Caesar never actually says that he led the cavalry outside the contravallation and considering the glory it would have accrued to him, I have no doubt he would have highlighted it in his account, so I suspect a subordinate led the outflanking force. 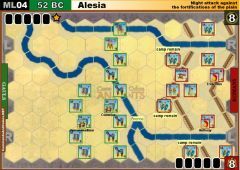 However, some histories I’ve read state that he did lead the outflanking cavalry and as it creates far better narrative and I have the backing of learned scholars (and I had to put him somewhere in the battle), I’ve gone with him leading the final heroic charge (more on Alesia Design Notes HERE). 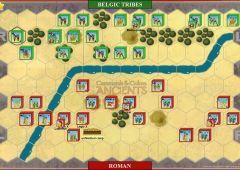 After the repulse of their first assault, the relieving Gauls sent an army of 60,000 under the command of Vercassivellaunus, a cousin of Vercingetorix, to attack a point on the northwest where the unfavourable lay of a hill had prevented the Romans from completing the contravallation. 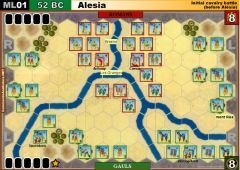 Once again the besieged army sallied out of Alesia and the outnumbered Romans were assaulted at multiple points on both lines of fortifications. 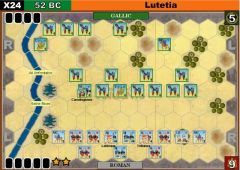 Caesar sent his cavalry commander Titus Labienus with six cohorts to the relief of the northwest breach while he personally led a counterattack that repulsed Vercingetorix’s men from the circumvallation. 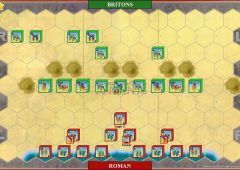 Then seeing that the northwest defense was in imminent danger of collapse, he made a desperate move and took a cavalry detachment outside the protection of the contravallation to outflank Vercassivellaunus’ army. 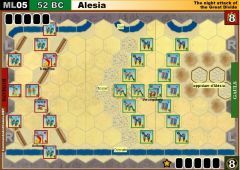 The next day the Gauls in Alesia surrendered. Vercingetorix was taken to Rome and five years later executed at Caesar’s triumph. 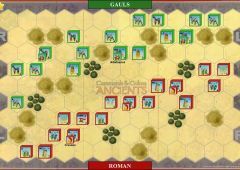 The defeat at Alesia brought an end to organised Gallic resistance and Gaul became a province of Rome. The Julius Caesar Rule is in effect. The Marian Legions Rule is in effect (by this stage of the siege the Roman Legions were hungry and exhausted). 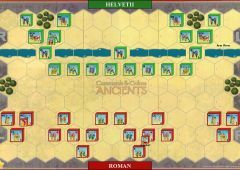 When a Gallic unit occupies the Fortified Camp hex at the start of the Gallic player's turn, remove the camp tile and the Gallic player collects a Victory Banner that cannot be lost. 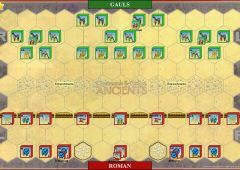 There are two separate Roman reinforcement forces marked with yellow icons, one led by Labienus and one led by Caesar, that start off the map and may enter the battle by play of separate Leadership cards. 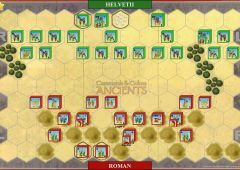 If a section Leadership card is played, the leader’s unit must enter on a baseline hex in that section and all other units in the relieving force enter on adjacent linked baseline hexes. 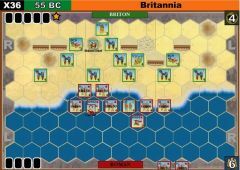 If a Leadership Any Section card is played the units may enter on baseline hexes in a section of the player's choice. 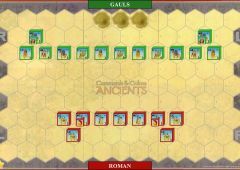 Labienus' force enters on the Roman baseline and at the end of the turn it enters play the Roman player draws two cards and his Command is permanently increased to 5. 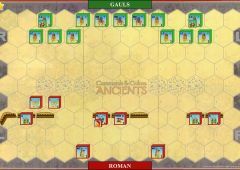 Caesar's force may not enter play until Labienus is in play, enters on the Gallic baseline and at the end of the turn it enters play the Roman player draws two cards and his Command is permanently increased to 6. 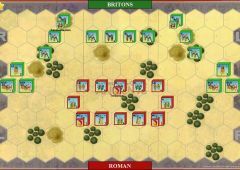 In both cases, reinforcement units may move their full movement on the turn they enter play, with the starting baseline hex considered to be the first hex of movement. 2 solitaire contests, with each side winning 8 - 5. 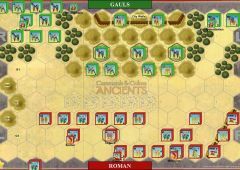 In the first, Caesar never entered the game, and the Romans were unable to stop the Gauls from going up the middle and eventually taking the Roman camp. Much different second game. 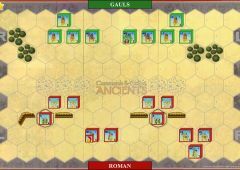 For quite a spell, the Romans could not get any leadership cards. 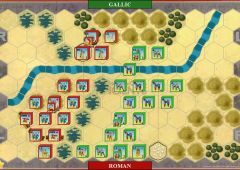 The Gauls were able the push the Roman right flank to the edge. Liebanus arrived in the nick of time to save the day. 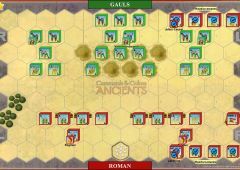 Much later, Caesar arrived much later on the Gaul's right flank and ended the contest. 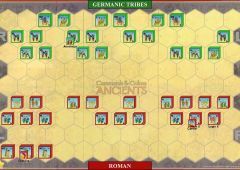 Unlike the first game, the warriors of the Gauls in the center, did not gets the cards to battle, as a result, most of the fighting occured on the flanks.